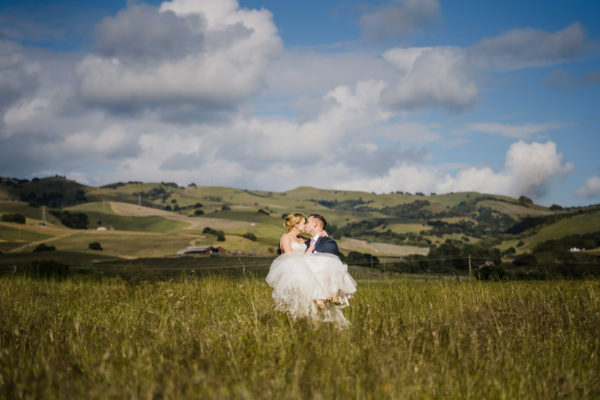 Among rolling hills and the beautiful backdrop of the Napa Valley, Traci and Dan tied the knot during their April wine country wedding at The Meritage Resort and Spa. Every memory and breathtaking moment of their special day was captured by Lily Rose Photography. True professionals behind the camera, Lily Rose Photography never disappoints- always phenomenal and always gets the perfect shot. With Bravo Weddings and Events coordinating, Traci and Dan’s wedding day was seamless and stress-free. The team from Bravo Weddings and Events knocks it out the park every time. On top of the Vineyard Deck, family and friends (of course that includes furry friends too!) assembled for Traci and Dan’s ceremony. As the bride made her entrance, “A Thousand Years” by The Piano Guys played in the background. Then after saying their “I Do’s”, the Mr and Mrs exited out to Ben Rector’s upbeat tune “Brand New”. Entering The Meritage’s stunning Estate Cave to “It’s Tricky” by Run DMC and the Beastie Boys, Traci and Dan were ready to get their wine country wedding reception started! First dance together as husband and wife, they chose “Say You Won’t Let Go” by James Arthur. Other special dances of the night included Traci dancing with her Dad to “Then They Do” by Trace Adkins and Dan dancing with his Mom to “I Cross My Heart” by George Strait. Wine Country Wedding Packing the Dance Floor! Then onto the dance party! And AMS Entertainment DJ Emil did not disappoint. Traci and Dan chose awesome music, everything from “Get Low” to “Shake Ya Tailfeather” to ending their dance party with Neil Diamond’s “Sweet Caroline”. 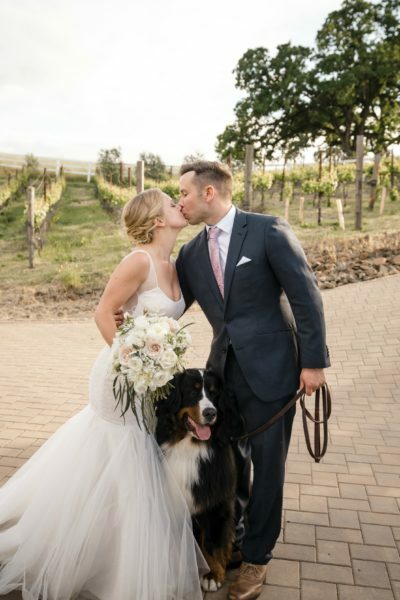 Good times, great friends and some amazing memories were made at this wine country wedding at The Meritage Resort and Spa. Congrats Traci and Dan!! 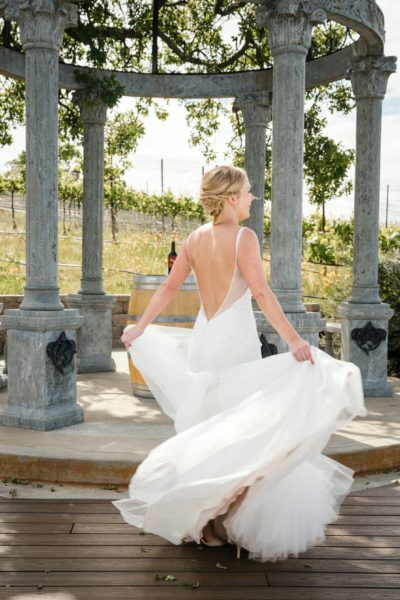 Thank you for letting us be part of your beautiful wine country wedding! 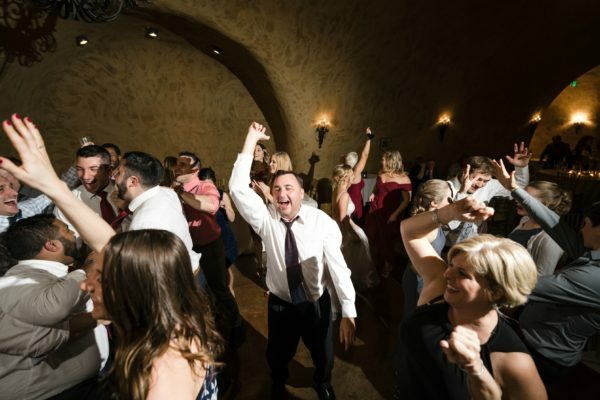 Interested in having a packed wedding dance floor? Then contact AMS Entertainment by email or phone at (707) 823-7359.